A man in his 50s was arrested at the scene. Vodka found in air conditioning unit in a van. COUNTERFEIT VODKA AND tobacco worth in the region of €27,500 has been seized in an intelligence led operation, by the officers from Revenue’s Customs Service. The 56 kilograms of illegal tobacco and 20 cases of counterfeit vodka on the M8 near Fermoy last night. The tobacco and vodka were discovered when Revenue officials and gardaí stopped and searched a large commercial vehicle on the M8 near Fermoy. Vodka found inside air conditioning unit. The goods were concealed in a large air conditioning unit which was bolted to the floor in the rear of the van. The goods and the vehicle were seized when tobacco dog Harvey reacted in the rear of the vehicle. The driver, a male non-Irish national in his 50s, was arrested and a file is being prepared for the Director of Public Prosecutions. 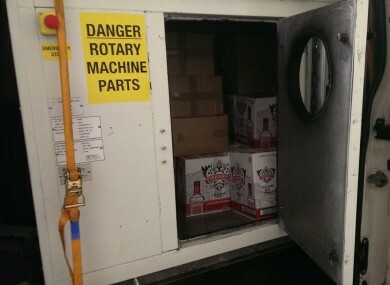 Email “Twenty cases of counterfeit vodka hidden in air conditioning unit seized”. Feedback on “Twenty cases of counterfeit vodka hidden in air conditioning unit seized”.